i love night owl paper goods. in march i posted about them and their fun springy cards, but they've added so many new fun goodies to their webstore that i couldn't resist an update. 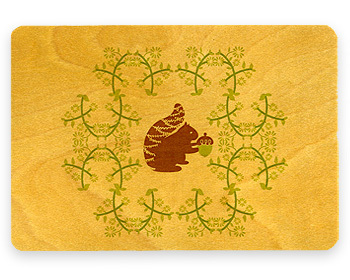 my favorite new products are their gorgeous eco-friendly wooden postcards at $5.50 a pop. 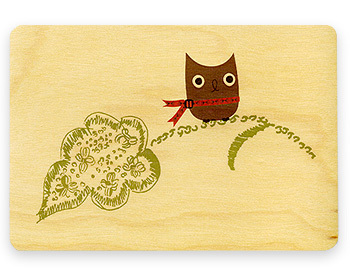 to quote: "night owl paper goods wooden postcards are a product of sustainable-yield forest management. the wood is cut very thin to achieve a high quantity of product from a small amount of raw material. in turn, little power and no water are used in the process. wood grain varies from card to card, creating quite a unique gift, display or letter. completely mailable for the new postcard rate of 26 cents!"